Range of tools including top brands. 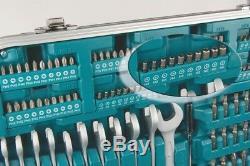 Makita P-90532 227 Piece General Maintenance Spanner Socket Screwdriver Bit Set. Irwin 8 Piece Blue Groove Flat Bit Set 4 x Faster Cut 12 14 16 18 20 22 25 28mm. Stock Code: P-90532 The P-90532 is the complete home repair kit from Makita. This is a versatile tool and accessory kit in a quality carry case for a work site or a garage. Comprising of 227 pieces it contains all the parts necessary to complete the job to the highest standards. Set Consists of 12 No. Combination wrench, CRV, Size: 6/8/10/11/12/13/14/15/16/17/18/19MM 8 No. Folding HEX key wrench, CRV, BLACK OXIDE, SIZE: 1.5 8MM Bit driver with magnetic tip, Carbon steel 1/4DR. (72T) Streamline ratchet handle 10 No. Nutdriver, 50BV30, sandblasted finish, SIZE: 5/5.5/6/7/8/9/10/11/12/13MM 13 No. Socket, CRV, SIZE: 4/4.5/5/5.5/6/7/8/9/10/11/12/13/14MM 11 No. Socket, CRV, SIZE:15/16/17/19/20/21/22/24/27/30/32MM 1/4DR. 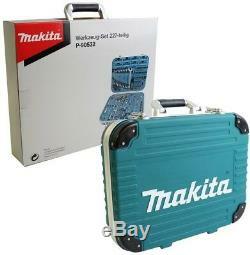 The P-90532 is the complete home repair kit from Makita. E-Socket CRV SIZE: E4/5/6/7/8 6 No. E-Socket, CRV, SIZE: E10/11/12/14/16/18 3 No. E-Socket CRV SIZE: E20/22/24 6 No. Spark plug socket, CRV, SIZE: 16/21MM 1/4DR. Spinner handle, CRV 2 No. Extension bar, CRV, SIZE: 2" & 4" 2 No. Xtension bar, CRV, SIZE: 5" & 10" 1/4DR. Sliding T-Bar, CRV 1/2"M X 3/8"F 3 Way socket adapter 1/4DR. Universal Joint, CRV 29 No. 30MM (L) BITS, S2 sandblasted, SIZES: SLOTTED: 6/6.5/8MM ; STAR: T25/27/30/35/40X2/45/50 Star with hole: T27/30/35/40/45/50 Phillips: PH1/PH2/PH3X2/PH4X2 Pozi: PZ1/PZ2/PZ3X2/PZ4X2 60MM & 80MM Magnetic holder 120MM Flexible Magnetic holder 30 No. 25MM (L) BITS, S2, in plastic box Sizes: Slotted: 3/4/5/6; Phillips: PH1/PH2/PH3/PH4; 80 No. 25MM (L) BITS, S2, IN 8PC Plastic holders, Sizes: STAR: 8/9/10/15/20x5PCS/25x4PCS/27x4PCS/30/40, Star with hole: T8/9/10/15/20/25/27/30/40, 3 No. Hex with hole: H3x2PCS/H4x2PCS/H5x3PCS/H6x3PCS, 20 No. Phillips: PH0x5PCS/PH1x5PCS/PH2x5PCS/PH3x5PCS Socket adaptor, 1/2FX3/8M Coupler CRV SIZE: 1/2" X 5/16". Our carriers apply a surcharge to certain UK Islands, Northern Ireland and the Scottish Islands, unfortunately we have to pass this charge on to our customers. Whilst we do not want to pass on surcharges to our customers we are unable to absorb the full cost of sending to these orders. The only exception to this are items that are delivered on a palletised service which will have to be booked in with a member of our Buyaparcel team. Any parcel being delivered by courier will require a signature on arrival. If you are not at home the driver will leave an information card. If the date and time is not convenient, you can simply either text back or reply back via the website to choose the next convenient date, leave in a safe place or leave with a neighbour. Please check the UKMAIL site for your closet depot. Details of these zones are below. Zone 2 The Highlands and Islands of Scotland postcodes IV, HS, KA27-28, KW, PA20-49, PA60-78, PH17-26, PH30-44, PH49-50, ZE. Zone 3 Northern Ireland, Isle of Man and Isles of Scilly -postcodes BT, IM, TR21-25. Please note - items over 1.4m are manually handled through sortation, this can cause the item to take up to 48hrs to be delivered. If you goods are being delivered on a pallet, you will need to sign for this. Our team work extremely hard to get your parcels to your door is the shortest possible time but please note that we recommend you do not book a plumber etc until you have received and checked your goods. Credit / Debit card - We accept all major credit and debit cards. The order must be sent to the same address as the billing address. Please use a traceable service, otherwise there is a possibility the courier could misdeliver your goods and your parcel will not be relocated. We cannot be responsible for which courier you choose to return any items back with. It is highly important that you check your goods as soon as they are received. Damaged items delivered with Palletways must be noted when you sign for it and reported to us within 24 hours. It must be signed as either damaged or unchecked for the claim to hold. Return costs will only be covered if authorised by a member of the Buyaparcel team. We cannot be held responsible for an arranged collection that fails. We cannot be held responsible for any costs incurred whilst you are in communication with our team. Makita x 100 Pozi No 2 25mm Hex Insert Bits In Candy Tub PZ2 P-49971. DeWalt DT7969 32Pc Screwdriver Bit Set & Holder Pro Grade PH Slotted PZ Torx. Makita P-65779 x 50 Pozi 2 Pozidrive PZ2 Power Screwdriver Bits 50mm In Tub. DeWalt DT70523 Black Impact Torsion Screwdriver Bit Set + Holder XMS18TORQ32. 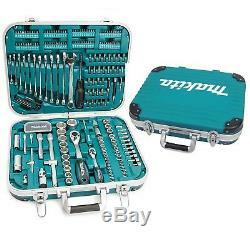 Makita P-57283 30 Piece Screwdriver Impact Driver Set 75-25mm + Butterfly Case. Makita 50 1/4 Inch Pozi Pozidriv PZ3 Power Drill Bits 50mm P-65785 + Candy Tub. 3 X Dewalt DT7500 60mm Magnetic Screwdriver Bit Holder DT7500QZ 1/4 PZ PH. Dewalt 10 Piece Extreme Impact Torsion Screwdriving Set Magnetic Pivot DT70518T. SIGN UP TO OUR NEWSLETTER. Stay up to date with our special offers & promotions. 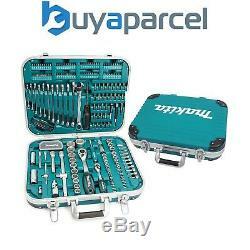 The item "Makita P-90532 227 Piece General Maintenance Spanner Socket Screwdriver Bit Set" is in sale since Monday, April 23, 2018. 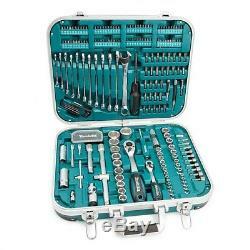 This item is in the category "Home, Furniture & DIY\DIY Tools & Workshop Equipment\Hand Tools\Hand Tool Sets". The seller is "buyaparcel-store" and is located in GB. This item can be shipped to all countries in Europe, Australia, United States, Canada, Brazil, Japan, New Zealand, China, Israel, Hong Kong, Indonesia, Malaysia, Mexico, Singapore, South Korea, Taiwan, Thailand, Chile.